Reliance Jio disrupted the telecom industry with its free and unlimited offers. There are no two thoughts that the Jio is one of the topmost telecom operators because of its months of free services that it offered to the customers. Apart from the unlimited voice calls and data offer, Jio also gained popularity in India because of the free and unlimited access it gives to the users of its apps. Your Jio tariff plan comes bundled with a bunch of services like — JioCinema, JioMusic, JioTV, among others and the telecom operator gives free and unlimited access to these apps to the users. But sadly, Jio is planning to take out the JioMusic app from the complimentary entertainment suite. Jio had previously announced that the company is partnering with music streaming app — Saavn to offer a great music experience to the users. Back in the month of March this year, Reliance Jio announced that the company would be merging JioMusic with Saavn to build completely new music streaming app. The official details regarding the revenue are yet to be revealed by both Jio and Saavn. If you’re a Jio user and use JioMusic on a regular basis, the company’s partnership with Saavn isn’t a good news for you. The reasons are two. 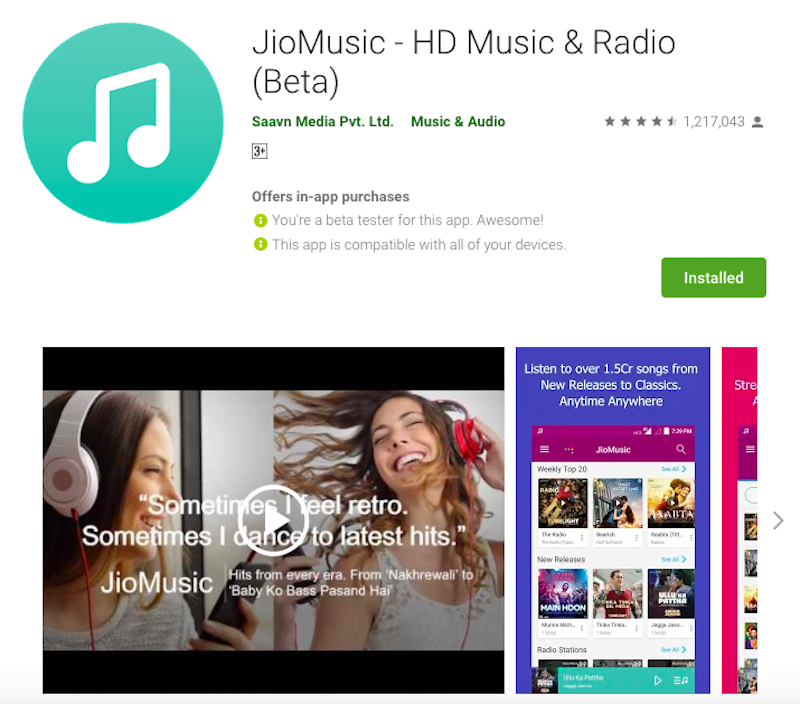 After the introduction of the new app, the JioMusic app will no longer be a part of the Jio complimentary entertainment suite. The second reason is, the new music streaming app — which will be called JioSaavn — will not be free for the Jio users. This means the Jio users who until now streamed music for free on Jio Music will not need to pay for streaming JioSaavn. Jio and Saavn together will offer a complimentary Pro access to the users for three months, but after this offer gets over, the users will need to pay. The plans are yet to revealed by the companies, but we expect them to be competitive enough compared to other music streaming services like Ganna, Wynk and others. On paying for the services, the users are said to get facilities like downloads, an ad-free experience, and more. Similar to JioMusic users, Saavn users will not be able to continue enjoying unlimited services by refusing app updates. Furthermore, Saavn has officially confirmed that the introduction of the JioSaavn is almost round the corner, which means, expect the app to go official by the end of this year. Some reports also suggest that Saavn Media is now the developer for both the apps — JioMusic and Saavn. There’s no information if the JioMusic or Saavn app will be discontinued or not. Possibly yes. There aren’t a lot of details available about the new music app for now. But some rumours suggest that the JioSaavn app will also have a separate section for JioTunes which will let users set a new caller tune for free of cost. As of now, there’s no official word regarding the availability of JioSaavn app, but some reports claim that the app is in its beta testing stage. Some of the beta testers have posted some screenshots of the app that looks like Jio-Saavn will retain the same design as Saavn for the new app.